The Talkhouse (formerly The Mytton Arms) was formerly a traditional 17th Century Coaching Inn situated in a scenic part of Mid-Wales, convenient to a number of villages and towns, the nearest being Caersws approximately 1.25 miles away with Post Office, Butchers, Spar, Hairdressers and train station links to Birmingham New Street and London Euston. The larger market towns of Newtown and Llanidloes are nearby and the coastal town of Aberystwyth within convenient access. The location is renown as an area of outstanding natural beauty together with many tourist attractions including Clywedog Reservoir, Hafren Forest, Powis Castle together with sporting interests of clay pigeon shooting, Mid Wales Rally Centre, horse riding and fishing to name a few. The Talkhouse has been refurbished over the past 10 years by the current owners to provide quality, comfortable accommodation which retains a wealth of character. The dining room with picture window looks out onto landscaped gardens with French doors leading out to various seating areas for alfresco dining and feature gazebo with views over open fields. Five en suite rooms provide a spacious self catering holiday let. The current owners live in the attached Annexe and we are advised that as of 15th February 2016, they have over £20,000 bookings for 2016. The detached Talkhouse Cottage/Annexe could also provide useful extra accommodation, completed in 2010 and finished to a high standard with Welsh Oak Frame entrance porch. Ladies Toilets - 2 WC's, 2 Wash basins, radiator. Gents Toilets - 2 Urinals, WC, radiator. Sitting Room - 4.02m x 4.65m (13'2" x 15'3") - 2 windows to front, 2 radiators, beamed ceiling. Bar - 6.97m x 4.52m (22'10" x 14'10") - open fire in brick inglenook, quarry tiled floor, front door, 3 windows to front, reception area, beamed ceiling, door to front, 2 radiators. Lounge - 7.42m x 4.22m (24'4" x 13'10") - large picture window to rear garden view, double doors to rear garden, radiator. New Kitchen - 4.46m x 3.39m (14'8" x 11'1") - new light oak fitted base and drawer units, granite worktop surfaces, belling range with extractor hood over, spotlights, breakfast bar, cooker comprising 3 ovens, 5 gas ring burner, stainless steel sink unit, strip lighting. Inner Hallway - staircase to first floor, staircase to cellar. Rear Single Bedroom (Rhiannon) - 3.86m x 2.31m (12'8" x 7'7") - views to garden and open countryside. Side Double Bedroom (Tybie) - 3.11m x 3.47m (10'2" x 11'5") - exposed beamed to vaulted ceiling. Front Double Bedroom (Tirion) - 4.86m x 3.08m (15'11" x 10'1") - entrance lobby with doors through to bedroom and en suite bathroom. Front Double Bedroom (Myfanwy) - 4.14m x 3.65m (13'7" x 12'0") - exposed beamed walls, radiator. Family Bedroom - 5.49m x 4.21m (18'0" x 13'10") - wood burning stove. Double Bedroom - 4.33m x 3.04m (14'2" x 10'0") - radiator, built-in double wardrobe. Bathroom - panelled bath, pedestal wash basin, WC, tiled floor, tiled walls, heated towel rail. Room - 3.63m x 2.98m (11'11" x 9'9") - potential Bedroom with En Suite. 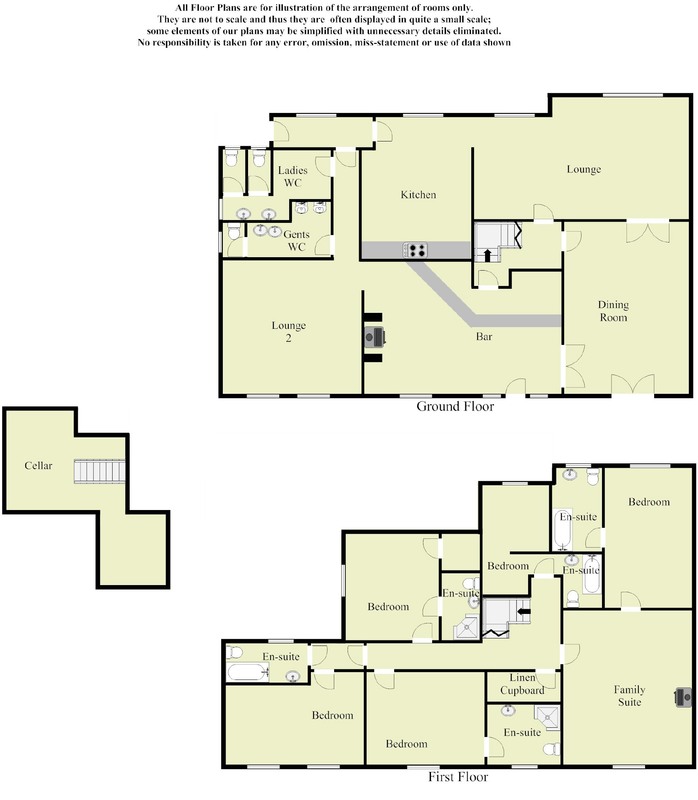 Room - 3.63m x 2.97m (11'11" x 9'9") - potential Living Room, staircase to mezzanine area. Room - 2.09m x 2.24m (6'10" x 7'4") - potential Kitchen with plumbing. Kitchen/Lounge - 8.17m x 3.43m (26'10" x 11'3") - attractive range of modern units with base, drawer, wall and glazed display wall units, marble worktop surfaces, Belfast sink, Range cooker, tiled floor, fireplace suitable for LPG fire or log burner , 2 radiators, stable door. Bedroom - 4.20m x 3.84m (13'9" x 12'7") - 2 radiators. Outside - The property is approached over a large gravelled parking area, beautiful landscaped rear gardens with feature gazebo, mature specimen plants and trees, vegetable garden, outside lighting, greenhouse, metal store shed and boiler room housing LPG central heating boiler. Services - Electricity, water and drainage connected. Fire alarm, emergency lighting and intruder alarm. N.B. The services, flues and appliances have not been tested and no warranty is provided with regard to their condition. Energy Performance Certificate (Epc) - A full copy of the EPC is available on request or from our website. Viewing - By appointment with the Agents. Directions - From our office proceed on A489 towards Llanidloes and after 6 miles and before the railway crossing turn right signposted Caersws. Proceed through the village of Caersws and after approximately 1? miles proceed under the railway bridge The Talkhouse is situated immediately on the left hand side. Money Laundering Regulations - On putting forward an offer to purchase you will be required to produce adequate identification to prove your identity within the terms of the Money Laundering Regulations (MLR 2017 came into force 26.06.2017) E.G: Passport or Photographic Driving Licence and a recent Utility Bill. Website - To view a complete listing of properties available For Sale or To Let please view our website www.morrismarshall.co.uk. Our site enables you to print full sales/rental particulars, book viewings, register your requirements on our mailing list and arrange a valuation of your property.